Keep your stock square to the fence! Under clamping pressure this unit flexes the baseplate greater than 1/16th inch and completely misaligns the cut. The thumbwheels to tighten the blocks even have fractured the baseplate at the T slot. Agree with others that the concept is good but the baseplate is pathetic. Needs to be aluminum. Whereas the idea is good with the tension on the clamp set to minimum, the base of the sled (Plexiglass) bends far to easily. It would be probaly better if the base was made out of something stiffer (alumimum plate perhaps). I purchased a deluxe coping sled. I find that when appling pressure to the hold down, the plastic base will pull up which takes the base off the router table. I will be returning this product because the base is not strong enough to resist the pressure exerted by the hold down. This tool is not very well constructed. Makes cross grain cuts easy! This large, heavy duty sled has the same features as sled #9548 above (except for the hold-down). Designed with a clear base and adjustable dual fence for more strength and rigidity. This heavy duty coping sled measures 6‑1/2" x 16" x 3/8" thick and will hold up to 4‑3/4" wide stock. 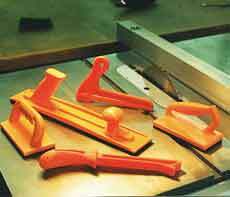 The coping sled handle can be repositioned using the pre-drilled mounting holes on the opposite of the base. This is provided for shaper and reverse feed operations. REMEMBER: Always keep router bits seated with at least 1 inch of metal gripped by the collet. Eliminate danger and enhance safety when working with small parts. Securely positions and aligns small parts with quick release clamping action, preventing slipping and keeping fingers away from sharp cutting edges. 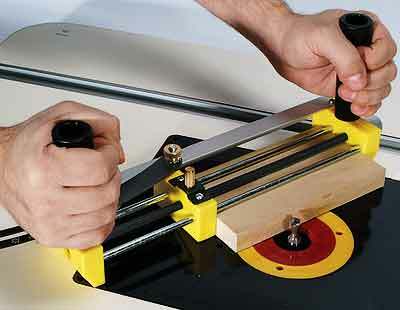 Large, easy-to-grip handles guarantee precision and control when custom-shaping small pieces. 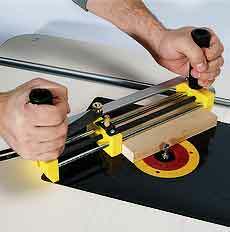 Can handle wood stock up to 10 and any cut angle up to 45º. 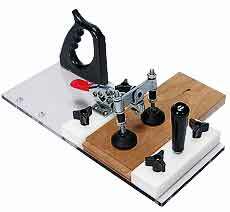 Works for router or saw tables, drill presses, band saws, joiners and more. Great for toy parts, door rail ends, and other detail jobs that would be dangerous or impossible without it. 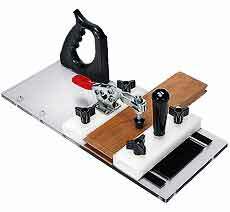 I used this to route 1/4 x 1/4 inch grooves in short pieces of red oak. It worked flawlessly. I really like this product. 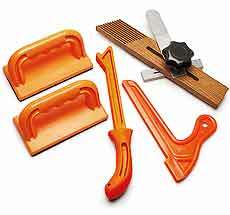 The 5 Piece Shop Safety Kit allows you to keep your hands safe for table saw, router table, shaper table and jointer operations. 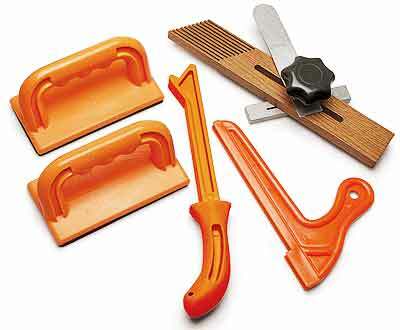 The set includes two push blocks, one push stick, one notch stick and one featherboard to fit a miter gauge slot. SAVE $9! 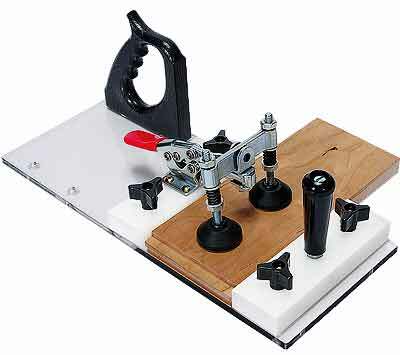 The MLCS Push Blocks & Sticks Set offers a safe and convenient way to run stock on your router table, shaper, table saw or jointer. They keep your hands safely away from cutting edges. They’re made with high friction rubber pads on their underside so that you get a sure grip. The notch-stick (E) has a slender profile that is ideal for narrow pieces. Shaped to hold down as well as feed. 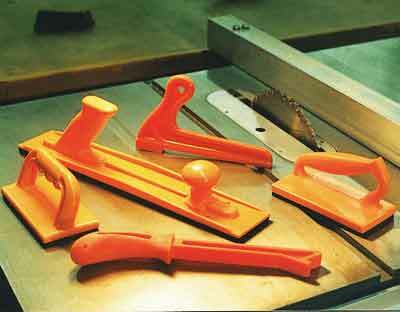 These safety tools from MLCS are built with excellent quality and are affordable. Most of their competitors charge stupid prices for the same thing. They are solid, assure good grip on the material and are sized right. Bottom line is they do the job well to control the material through the cut, keep my hands and fingers safe and will last forever without sucking the life out of my wallet. 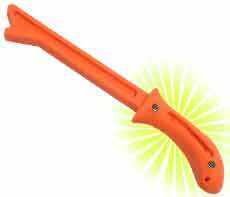 The Contoured handle offers a more comfortable grip.